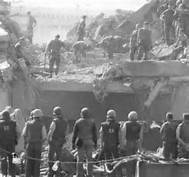 The Beirut Barracks Bombings (October 23, 1983) occurred when two truck bombs struck buildings housing U.S. and French military forces in Lebanon—killing 299 American and French servicemen. An obscure group calling itself ‘Islamic Jihad’ claimed responsibility for the bombings. Suicide bombers detonated each of the truck bombs. In the attack on the building serving as a barracks for the 1st Battalion 8th Marines, the death toll was 241 American servicemen: 220 Marines, 18 sailors, and three soldiers, making this incident the deadliest single-day death toll for the United States Marine Corps since World War II’s Battle of Iwo Jima, the deadliest single-day death toll for the United States military since the first day of the Vietnam War’s Tet Offensive, and the deadliest single attack on Americans overseas since World War II. Another 128 Americans were wounded in the blast. 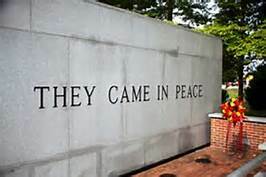 Thirteen later died of their injuries, and they are numbered among the total number who died. In the attack on the French barracks, the nine-story ‘Drakkar’ building, 55 paratroopers from the 1st Parachute Chasseur Regiment and 3 paratroopers of the 9th Parachute Chasseur Regiment were killed and 15 injured by a second truck bomb. This attack occurred just minutes after the attack on the American Marines.